What is a Stroker motor? - 2019 Mechanic Guides! A Stroker motor or Stroker engine is an engine block that has been machined to increase the displacement of the engine by lengthening the travel of the piston. The only way to increase the pistons travel is to change the crankshaft, allowing the crank pin to move farther away from the center of the axis of rotation of the crankshaft. This does increase displacement, but it also lowers the safety limit to which the motor can rev when compared to stock configurations. Standard internal combustion engines take linear force and turn it into rotational force through a rotating assembly commonly called the “crankshaft.” The engines cylinder size is measured by diameter or “bore” and the stroke height; this gives it its overall displacement. There are a number of piston configurations, most are 4 strokes, but some smaller engines provide 2-stroke. The steps of a motor include intake, compression, combustion, and exhaust. The intake is how the engine receives a combination of air and fuel, the compression is how the pistons force the mixture of air and fuel in the combustion chamber, and the combustion forces the pistons to move up and down, transferring into rotational force (torque) through the crankshaft. A fill revolution or rev is measured in RPM, and the torque is what drives your car forwards and is measured in lbs per square foot. Torque is a rotational force measured by lb-ft and is measured by the power you exert on a rotational object, such as how much torque you get from handling a spanner to a bolt. The same goes for a car engine, where Horsepower = (Torque X RPM)/5252. When you want to take an engine block and make it perform more efficiently, you need to change a lot of its parameters, one of which is changing the stroke. Hence and engine that has its bore length changed, or stroke length changed, is called a Stroker. There are Stroker kits readily available for many engine configurations; these kits provide various options to lengthening the stroke by increasing the length of the crankshaft throw and decreasing the length of the connecting rod. There is another method, which is the opposite, and here you decrease the crankshaft throw and increase connecting rod length. This is also a type of Stroker engine and is used to make the engine smaller for racing. 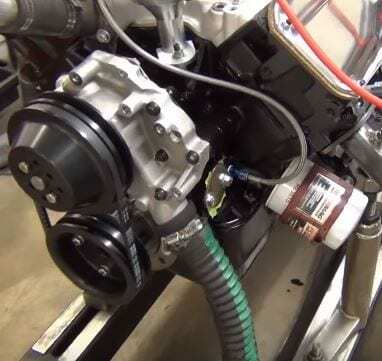 Another option is to change the bore, and machine it to a larger stroke, which can then be further enhanced with a Stroker kit, giving you an even higher stroke gain. You now know that a small stroke will lead to higher revs, and high revs make more horsepower, but that’s not the only way to create power. The torque as mentioned above is an integral part of creating horsepower, and you don’t need to concentrate on a faster turn when you can also increase the strength exerted to make the turn. In other words, torque will move heavier objects, and the more torque you have, the easier you can move that object. So, by combining higher torque and faster revs you gain higher horsepower and overall power to move the car with less exertion, and that means more fuel economy when comparing RPM, or much faster cars for racing, or more powerful pulling power for towing. A Stroker engine is a standard engine that has been modified to provide a longer stroke when combined with other accessories. This longer stroke can enhance faster revs and produce insane power and speed. A Stroker engine can stand alone by itself without all the aftermarket upgrades, but if you want to maximize your engine’s performance you will always add better carbs, a supercharger, and turbocharger as well as a completely new aftermarket exhaust system with manifold header and change the air filter to a cool air filter system. You might also change the wheels and tires. The bottom line is this; once you start with a Stroker engine, you end up upgrading much more than you originally intended to start off with.